What follows is a brief anecdotal history of the Metropol Hotel – but for a glimpse of the hotel today, you can watch the interview that ran on CBS Sunday Morning with me and CBS senior correspondent (and former Moscow bureau chief), Liz Palmer. 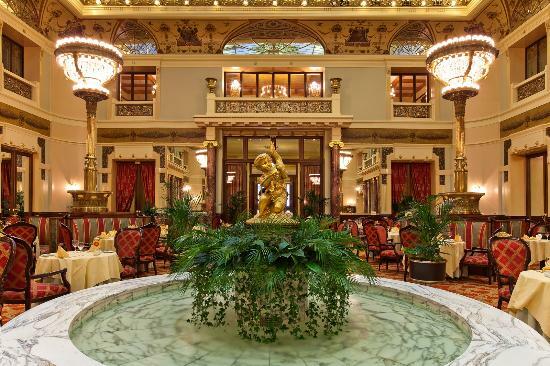 Opened in 1905, the Metropol Hotel is situated on Theatre Square in the historic heart of Moscow. Like the other grand hotels of the era (such as the Waldorf Astoria in New York, Claridge’s in London, and the Ritz in Paris), the Metropol set the standard in its city for luxury and service. It was the first hotel in Moscow to have hot water and telephones in the rooms, international cuisine in the restaurants, and an American bar off the lobby. 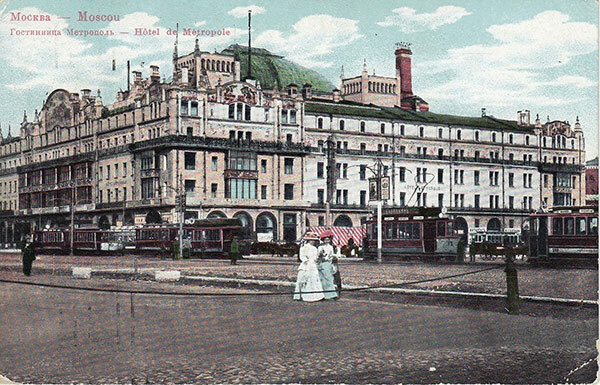 Thus, within days of its opening, the Metropol became the preferred stomping ground not only for cosmopolitan travelers, but for the glamorous and well-to-do of the city. 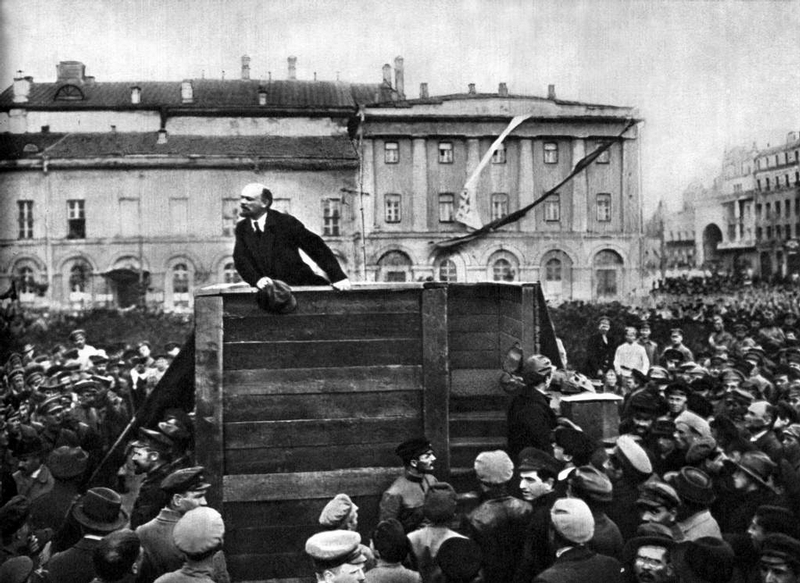 When the victorious Bolsheviks decided to return the capital to Moscow (after 400 years in St. Petersburg), the city did not have the necessary infrastructure to house the new government. So, the Bolsheviks seized the Metropol, threw out the guests, renamed it the Second House of the Soviets, and used it to billet officials and house various departments of the fledgling state. 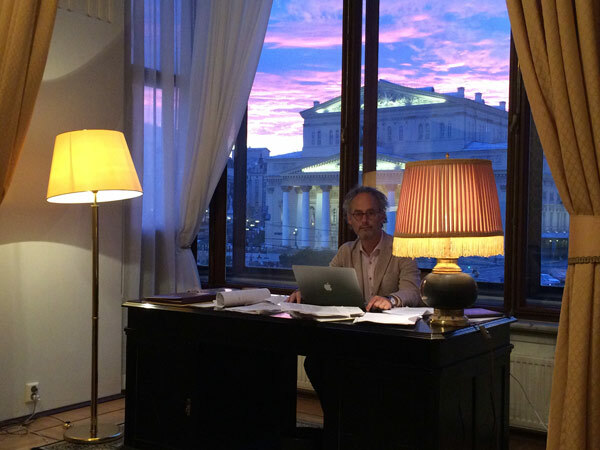 In fact, it was in Suite 217 of the Metropol that Yakov Sverdlov, the first chairman of the All-Russia Executive Committee, locked the constitutional drafting committee, vowing he wouldn’t turn the key until they’d finished their work. Within a measure of hours the committee reemerged with that document which officially heralded the victory of the Proletariat over the forces of privilege. Right then and there the Metropol’s existence as a grand hotel should have come to an end. But when the major European nations began restoring trade and diplomatic relations in the 1920s, the Bolsheviks realized that the hotels of Moscow were going to provide Western visitors with their first impression of the new Russia. Should weary ambassadors or businessmen spend their visit in some austere hostel with shared bathrooms, humble furnishings, and limited services, they might draw the conclusion that Communism was failing! So, in order to signal success, the Bolsheviks found themselves kicking out the apparatchiks and restoring the Metropol to its original glory complete with uniformed bellhops in the lobby, silver service in the restaurants, and American jazz in the bar. Thus, during those initial decades of the Soviet Union, which were characterized for the citizenry by all manner of hardship, the Metropol earned a mystique of extravagance equal to that of the Plaza or the Ritz—despite being around the corner from the Kremlin and a few blocks from the Lubyanka (the dreaded headquarters of the secret police). With its fine food, lavish entertainment, and liberal behavior, the hotel became something of an Oz in the popular imagination—a Technicolor paradise hidden in the midst of a black and white metropolis. Although, for this very reason, the hotel also became a popular trolling ground for the secret police who came in search of loose-lipped Westerners or compromised Russians. What follows is a brief chronology of citations describing life in the Metropol from various memoirs and Russian novels. Close readers will note that some of these citations have been collaged into my depiction of the hotel. “Moscow’s Metropol bar is the focal point of a glittering bourgeois society in the dull setting of Proletarianism. It is just an alcove off the main dining room of the hotel, yet famous as the starting-point of many an American friendship, where roving drinkers from (at that time) dry America, fed up on the glories of building Communism and tourist glimpses of the Kremlin, rushed to quench their thirst and feast their eyes on the Soviet barmaids. There were plenty of girls in the restaurant with foreigners. Varya knew they were given fashionable clothes, rides in automobiles, and that they also got married and went to live abroad. She wasn’t interested in foreigners but in this restaurant, with its fountain and music and famous people all around her. Wasn’t it this she was trying to escape to from her dingy communal apartment? “News from Moscow is that the trial and execution for high treason, terrorism, and espionage of eight officials were officially announced including Karakhan, Yenukidze, Zukerman, and [“Baron”] Steiger. Poor Steiger. He represented the Bureau of Cultural Relations or something of that sort. He was, in fact, a sort of liaison man, apart from the Foreign Office, between the Kremlin and the Diplomatic Corps. He invited some of the party to the opera for a special performance and thereafter took us to the ‘night club’ at the Metropol Hotel. Shortly after one o’clock he was tapped on the shoulder, left the table, did not return, and was never seen thereafter”. “Alone, alone, I am always alone,” replied the professor bitterly. “In your flat,” the professor suddenly replied casually and winked. “I can’t seem to stay away from the Metropol: it is a highly colored small station in the somber world of the embassy where I live, and a relief from the painful world of my Russian friends. It’s a grubby joint but it’s lively and I have taken to dropping over almost every day to listen to the stories about the night before, or the ones that Alex Werth remembers from the first year of the war, or Henry Shapiro remembers from even further back. Then I wander up and down the corridors, looking for people to talk to. ‘Why in heaven’s name is that interesting I asked.